The reorganisation makes sense, but can it work? Is it time for Ballmer to move on? Microsoft has announced a major reorganisation of its business, designed at being more coordinated and nimble across the company. But can the gamble pay off? Steve Ballmer sent out the full details of the shake-up in an email to employees and one thing is for sure - this has to be Ballmer's final throw of the dice. Despite the strategy making sense - more on that shortly - you have to think its ultimate success lies with Ballmer. He badly needs to prove himself again or leave. Why? 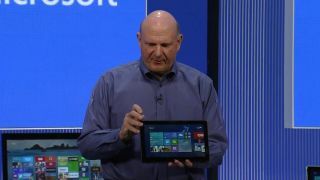 It's worth remembering that Ballmer was the guy who said the iPhone wouldn't get "any significant market share" and made Microsoft seriously late to the phone and tablet party. Add in the lukewarm reaction to and sales of Windows 8, you do wonder if it's time that Microsoft moved on to move up. But aside from the fact Ballmer is staying, there appear to be zero redundancies at present and most management are simply having a reshuffle, the key change is that Microsoft's "strategy will focus on creating a family of devices and services" rather than its old Bill Gates-era adage that Microsoft was a "software and services" company. Expect more hardware like Microsoft Surface and Xbox One and less overall focus on traditional desktop software like Windows and Office - the traditional cash cows. Another key change is that all operating system work is now under the same business unit led by former Windows Phone head Terry Myerson – meaning that the Xbox OS, Windows and Windows Phone are all under the same roof. It's hardly surprising this is the case – all now share a common Windows core based on Windows NT. The other key divisions are Applications and Services, Devices and Studios (including Xbox One, Surface and periperals) and Cloud and Enterprise. In the latter group, Office has now been lumped in with Bing, Skype and other cloud-centric services. There is also little division between the consumer and business-orientated parts of the company. The goal here is to get previously disparate parts of the company working together and able to react to market conditions faster. There has been a lot of common work between the operating systems thus far, but it's not been enough and teams such as those in Online Services have been too far removed from those in the Windows group. Microsoft's goal is to use even more common technologies and services in an expedited way for the benefit of more of the company, rather than everything being housed in separate vertical units. Microsoft needs to arrive here, and not least, as Ballmer himself notes, the game has changed, with Microsoft's "form of delivery shifts to a broader set of devices and services versus packaged software." Google may be the next Microsoft – believe us when we say we believe Google is becoming more corporate every day – but it is still better able to judge when products are ripe for launch and, crucially, when they are ready for a cull. But moreover, Microsoft has to hope this restructure solves its key problem - that it has continually failed to get its products and services working in the seamless way that seems to come so easily to Google and Apple hardware, software and online offerings and has for so long been sorely lacking from much Microsoft thinking. Key decisions like Hotmail becoming Windows Live Hotmail becoming Outlook.com (the latter is a consumer product named after a business app) have reeked of long-term indecision and lack of focus. Do you have a Windows Live Account or a Microsoft Account? Why doesn't the Windows 8 Skype app work very well with Windows 8? Who at Microsoft thought it was a good idea to prevent game sharing on Xbox One? Why do we own a bit of Facebook yet there's no Facebook app for Windows 8? All that kind of stuff. So getting everything working better together is the Holy Grail that Microsoft is hoping to find with this restructure. It has the technology and know-how, it just needs to put everything together. So while "One Microsoft" may be pure cheese, the key idea is sound. It's also absolutely crucial to the success of the company in an age when Microsoft can no longer be totally reliant on sales of Windows and Office.